Each of our spacious floor plans offers a host of amenities designed to fit any lifestyle. 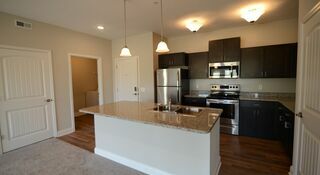 Our full-equipped kitchens come with granite counter tops, a built-in microwave, full-size refrigerator, and an optional island layout that is perfect for entertaining. The full-size side-by-side washer and dryer in a dedicated laundry/storage room is a convenience not often found in an apartment home. Large windows, plush carpeting and ample closet space make for a truly comfortable living space. Copyright © 2019. Traditions at Royalton Place.